Negative sentiment towards immigrants is often based on fears about their ability to integrate into economic, political, and social institutions. This column analyses the impact of the influx of Irish immigrants into the US in the 19th century. It shows that the children of immigrants had assimilated in terms of labour market outcomes within one generation, providing some perspective for the current debate about immigration policy. A large wave of impoverished and desperate immigrants had recently arrived in the US. Their predominant religion was at variance with that of the great majority of Americans. Politicians and commentators cautioned that the immigrants were a threat, citing concerns that they could not assimilate and might undermine the nation’s democratic institutions and economic prosperity (Anbinder 1992, Hirota 2017). These were the Irish, considered a degraded and disreputable ‘race’ by many Americans at the time. The year was 1850, four years after the onset of an historic famine that had decimated the Irish population. Exact figures are impossible to establish, but it is estimated that out of an 1841 population of about 8 million, approximately one million Irish died and another million emigrated during the famine, mostly to the US. The migrants who made it to the US, though quite poor relative to the typical American, were hardly the poorest of Ireland’s poor, who could not afford to emigrate and suffered and perished in extraordinary numbers (Ó Gráda 1999). Today, few Americans wring their hands over the impact of the Irish on American economic and social history. Rather, many more appear to celebrate than regret it. It is also clear that because the US had essentially open borders at the time of the famine, many thousands of lives were saved (Ó Gráda 2019). The moral case for aiding refugees is not in question. What is less clear is how the Irish refugees from the famine and their children fared once in the US. Arguably, this was the largest wave of refugee immigrants that the US has ever received, but data limitations have made it difficult to study how their lives and careers unfolded over time and generations. In a recent working paper (Collins and Zimran 2018), we built and analysed a new dataset of linked census records to provide insight on some basic questions about the Irish who arrived in the US during the famine and their children’s subsequent labour market outcomes. We took advantage of complete transcriptions of the 1850 and 1880 US census manuscripts to search for the same person at two points in time. In essence, this process turns the massive census cross-sections into a smaller panel dataset. Because these censuses did not inquire about when immigrants arrived in the US, we relied on information about the birthplaces and ages of children in the household in 1850 to distinguish the famine-era arrivals from previous immigrants. Ultimately, this yielded a sample of children with linked census records from 1850 to 1880 whose parents can be split into “famine-era arrivals” and “earlier arrivals.” We see the children in their parents’ household in 1850 and, therefore, observe their early life circumstances (e.g., their fathers’ occupations and location); we see them again in adulthood in 1880. Although our main focus is on the children of Irish immigrants, we also collected data on the children of white US-born Americans, as well as those of British and German immigrants. This enables comparisons of intergenerational changes in economic outcomes across US native and immigrant groups. The scope of our study is limited in the way that economic inquiries into immigrant ‘assimilation’ often are (e.g., Borjas 1993, Card 2005, Abramitzky et al. 2014)—we focus primarily on the labour market outcomes (rather than on the cultural assimilation) of the Irish who arrived during the famine and their children. The scope is further limited by the kind of information that the US census collected in the mid-1800s. We can observe property values, occupation, and literacy, but not income. Finally, we can only link the census records of male children because name changes at marriage make it extremely difficult to link female children. To determine how different the famine-era Irish immigrants were from earlier Irish immigrants, contemporaneous immigrants from Britain and Germany, and US-born adult men, we started by comparing literacy rates. Figure 1 shows that in 1850 famine-era Irish heads of household were 11% less likely to be able to read than US-born heads of household. They were also 7% less likely to be able to read than the Irish heads of household who arrived before the famine. 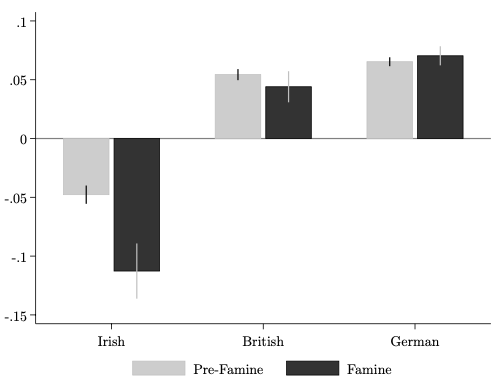 This substantial decline in literacy rates over pre-famine (before 1846) and famine-era (1846-50) arrival cohorts was not evident among British and German immigrants, and likely indicates that, at the margin, the famine pushed less educated and more impoverished Irish to move to the US. 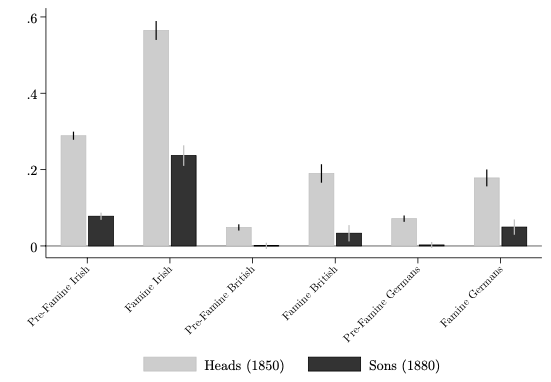 Figure 1 Literacy rates of immigrant heads of household in 1850, expressed relative to US-born household heads. This difference in basic human capital was also reflected in occupational outcomes. The average famine-era Irish head of household was 57% more likely to be in an unskilled occupation in 1850 than the average native-born head of household, and 28% more likely to do so than the average pre-famine Irish arrival. All told, there was nothing about the famine refugees that would favourably impress policymakers concerned primarily with immigrant ‘quality’. The new Irish immigrants were on average poor and unskilled. Under these circumstances, how far, if at all, were the children of the famine-era Irish able to narrow the gap in economic status relative to their peers in the US as they moved into adulthood? At first glance, the economic disadvantage faced by the famine-era Irish fathers appears to have been passed down to their sons. In 1880, the sons of Irish men who arrived during the famine were more likely than other men of the same age to be in an unskilled occupation. But as Figure 2 shows, the gap between the sons of US-born men and the sons of famine-era Irish immigrants was considerably smaller than the gap between their fathers 30 years earlier. Whereas famine-era Irish fathers were 57% more likely to hold an unskilled occupation than US-born men in 1850, their sons were only 24% more likely. This is evidence of fairly strong convergence in labour market outcomes between immigrants and natives, even for the most impoverished and desperate group of mid-19th century immigrants. Evidence from analysis with more refined occupational rankings is consistent with this basic finding of convergence. Clearly, the labour market outcomes of Irish immigrants circa 1850 were a poor guide to inferring the group’s ability to assimilate in to labour markets over a longer period. How much of the gap between the sons of famine-era migrants and the sons of natives in 1880 is explained by the fact that the Irish children on average had fathers with less human capital and lower occupational status? When we compare the sons of Irish to the sons of natives with similar 1850 household characteristics, we find that the sons of the famine Irish were only about 8% more likely than the sons of natives to hold an unskilled occupation. Obstacles that were likely particularly relevant to the children of Irish famine-era migrants—such as poverty, a nativist backlash against immigrants (especially Irish Catholics), intense labour market competition from new waves of immigrants, and, for some, the physical and psychological trauma of the famine itself—did not stop the Irish from closing, in a single generation, most of the large gap in economic status that their fathers faced relative to natives soon after arrival. One must always be cautious in drawing lessons for modern policy from historical experiences. The open borders that enabled the mass migration of the Irish to the US have long been closed, and the US (and world’s) economy has been much transformed in the century-and-a-half since the Irish sought refuge from the famine. Nonetheless, this evidence of intergenerational economic assimilation and a clear history of ‘assimilation and contribution’ by the Irish in America provide useful historical perspective at a time when refugees are once again viewed by many with scepticism and scorn. Abramitzky, R, L P Boustan, and K Eriksson (2014), “A Nation of Immigrants: Assimilation and Economic Outcomes in the Age of Mass Migration”, Journal of Political Economy, 122 (3), 467–506. Anbinder, T (1992), Nativism and Slavery: The Northern Know Nothings and the Politics of the 1850s, New York: Oxford University Press. Borjas, G J (1993), “The Intergenerational Mobility of Immigrants”, Journal of Labor Economics, 11 (1), 113-135. Card, D (2005), “Is the New Immigration Really So Bad?”, Economic Journal, 115, F300-F323. Collins, W J, and A Zimran (2018), “The Economic Assimilation of Famine Irish Migrants to the United States”, NBER Working Paper 25287. Hirota, H (2017), Expelling the Poor: Atlantic Seaboard States and the Nineteenth-Century Origins of American Immigration Policy, New York: Oxford University Press. Ó Gráda, C (1999), Black ’47 and Beyond: The Great Irish Famine in History, Economy, and Memory, Princeton: Princeton University Press. Ó Gráda, C (2019), “The Next World and the New World: Relief, Migration, and the Great Irish Famine”, Journal of Economic History, forthcoming.